For people with very limited mobility, even going from the bed to the toilet can be difficult, especially if the toilet entrance and the passage to the toilet are narrow. This is where a wheelchair commode can come in very handy. 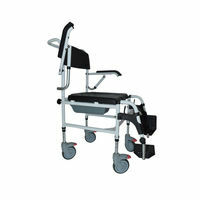 This wheelchair commode can be used as a regular wheelchair as well as a commode. The detachable armrests help people to easily slide from their beds to the wheelchair and back while the detachable footrests help in reducing the space required while transferring the wheelchair from one place to another. For people with very limited mobility, even going from the bed to the toilet can be difficult, especially if the toilet entrance and the passage to the toilet are narrow. This is where a wheelchair commode can come in very handy. 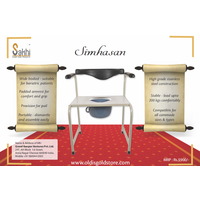 This wheelchair commode can be used as a regular wheelchair as well as a commode. 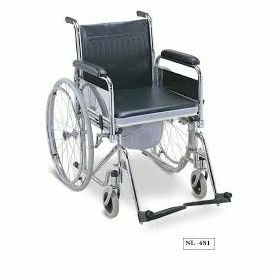 The detachable armrests help people to easily slide from their beds to the wheelchair and back while the detachable footrests help in reducing the space required while transferring the wheelchair from one place to another.